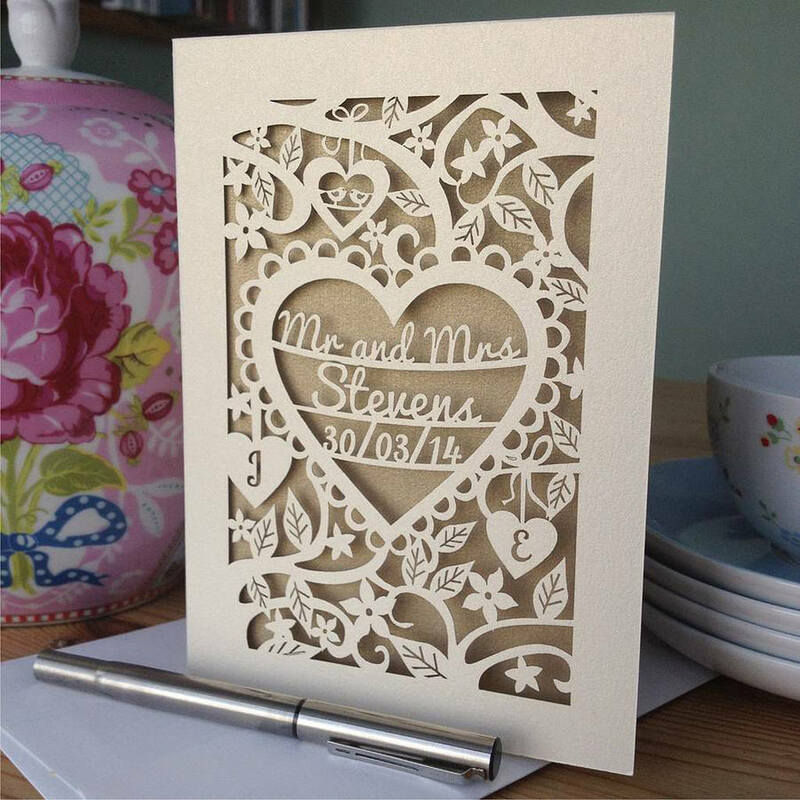 This personalised papercut wedding card is perfect for any wedding day. It can be personalised with the happy couple's surname (cards will read "Mr and Mrs NAME, DATE) and initials in the smaller hearts if required. It is available in a range of colours, please see images for card and paper insert options available. Please add personalisation details (name and left and right initial if required, if no initials are provided we will replace this with a heart) in the "Note To Seller" box at the checkout. Please see our shop (Pogofandango) for more unique laser cut papercut cards, special age cards, kids birthday cards and gifts. This card is so beautiful and unique. It will definitely be a keepsake. We are in the process of launching a wholesale range, please contact us for further information. Laser cut card can occasionally turn brown around cut edges- this can be minimised and we do everything we can to reduce this, but is never completely avoidable. Please keep laser cut cards out of really bright sunshine as this seems to encourage scorching to show up. We aren't often able to take on bespoke commissions because of the high number of orders we receive, but if you have something specific in mind, please contact us to discuss further. We do not offer gift wrapping but we can add a personalised gift message for you.